Dan Jurgens steps in for the new story arc, “Evil’s Might.” He’s been a proven myth-maker for decades in the Superman titles, so having him on the Green Lantern franchise can only be a good thing. I have total confidence. Artist Mike Perkins, a little less so. Perkins rendering of scale is impressive. His starships resemble something created by ILM, in configuration and texture, but who among of us of a certain age hasn’t been influenced by major movie film franchises? Where I question Perkins’ skill is in faces, as some of his characters make awkward expressions of pain, impatience and disappointment. Some seem as if they’re rendered from photos, attempting to convey complex emotions where a less-is-more approach is called for. Adding to the photo reference argument are two panels in particular. Page 12, panel 2 (a nightclub scene) and page 26, panel 1 (a collapsing building). Both share the appearance of a multi-generational Xerox of a photo. Other pages and panels seem to use the same short-cut for backgrounds. I don’t mind the occasional cheat, but here it seems excessive. In regards to the story as a whole, I see a potential turning point for one of my recent gripes. 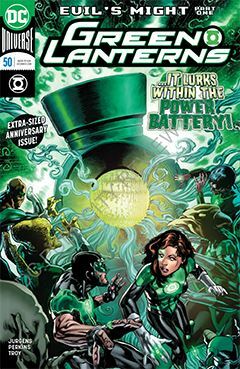 The two GL titles – Green Lanterns and Hal Jordan and the Green Lantern Corps – have functioned mostly independently of one another, almost to the point of exclusion. But now, it appears that the GL Corps is acknowledged as having a role in the lives of Simon Baz and Jessica Cruz, the stars of this particular series.